Ashley Gray is the managing director of Vetsure Pet Insurance and director of the Veterinary Management Group. 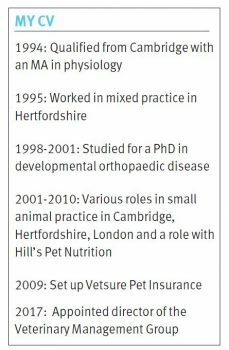 He has written an article on his veterinary career and why it is important to have a new generation of veterinary leaders and innovators. This article was written for Vet Record. ALTHOUGH I enjoyed working in small animal practice, I soon found out that while many of my peers were eagerly comparing notes about the latest surgeries they’d performed or the new techniques they’d learned, what I found more rewarding was the time spent in the consulting room, where I was focusing on both the pet and their owner. Pets bring such joy to people and it is the power of these human/animal relationships and the value that pets bring to our day-to-day lives that I have always found deeply touching. And, after 12 years in practice and some time spent in the veterinary industry, I realised that wielding a scalpel was not the only way to nurture these precious relationships. I’ve never been fearful of change and am prepared to be disruptive if I see an opportunity. In 2009, I did just that. I’d become interested in pet insurance and felt that the pet insurance models I’d seen were not fit for purpose. They were businesses and needed to make a profit, but I felt they could continue to make money while still putting the relationship between pet and owner first. I did some research and then decided to set up my own insurance company, Vetsure Pet Insurance. As with any start-up, we faced challenging times early on. I was working just as hard, if not harder, than when I was in practice and had to learn quickly ‘on the job’, taking advice when it was available and through the odd course here and there. These were largely regulatory courses introducing me to the compliance requirements of the Financial Conduct Authority, essential for a financially regulated company. I gained financial and insurance underwriting expertise by learning from the accountants and underwriters I employed. I learned that, once you get past the jargon, it wasn’t as challenging as I’d thought. We came through the early challenges and were stronger as a result. As a business owner, it’s the tough times that help you to learn and put things into perspective. I’m proud that, 10 years on, we have the highest customer satisfaction scores on online consumer sites. We work with more than 550 veterinary practices, have experienced our third year of growth in excess of 20 per cent and our forecasts for this year look healthy. We employ 25 people and have won industry awards for innovation and customer service. We are the only company to offer health plans alongside pet insurance and I firmly believe that the holistic provision of healthcare budgeting is the future. When I watch my team in action, I can become quite emotional with pride. It is the dynamic between pet and owner that still drives me today. In my career I have had the privilege of caring for dogs that have been trained to support the disabled; dogs that give people a reason to get up every day; cats that help elderly people deal with loneliness and pets that have helped children, including my own, deal with the crazy stresses that life today throws at them. It’s a sad indictment of our society that pets, for many, are replacing human/human interactions. Perhaps it’s easy to understand why: our pets don’t ask too much from us, never judge us and are generally always there for us. They are an antidote to all the bad aspects of 21st century life. Vets and the wider veterinary sector have a responsibility to help protect them. I joined the board of the Veterinary Management Group (VMG) in 2017, primarily to provide an industry perspective and insight. I am constantly inspired by its leadership team. Their dedication and commitment to drive up standards of veterinary management and leadership is absolute and, as volunteers with busy day jobs, they give a great deal for little personal return. I am concerned that a vacuum of leadership within veterinary practice could emerge over the next decade as so many experienced leaders are selling their practices to external owners and moving on. Because of this, being part of a team helping to develop the next generation of veterinary managers and leaders feels like an important thing to do. We will avoid this vacuum if more of us step forward, so my message to my fellow veterinary professionals – vets, nurses, practice managers or support staff – is to do just that. Long gone are the days when the only owners were 50/50 vet partners who both worked in the business. Today, there are opportunities to lead and to innovate across the sector just waiting to be grasped and, whatever your role, if you are passionate and committed to your clients and their animals, you can become a manager, a leader, a shareholder and an innovator – whether in a practice or in industry. You might even want to set up your own business! The knowledge you need to take up a non-clinical role, such as running a business, can be learned – I am proof of that – but genuine selfless passion for our great profession and our clients cannot and both are important. As the profession gears up to face the tough challenges ahead, we need a new generation of veterinary leaders and innovators more than ever. If you’re ready to step up and have the commitment to stick at it, you could be one of them regardless of how little you think you know now. The British Small Animal Veterinary Association and the Wales Veterinary Science Centre have launched Vets Cymru, a two-day event offering large and small animal ‘CPD by the sea’ for vets and vet nurses, saying ‘Croeso I bawb!’ (Welcome to all!). The event will take place in Aberystwyth on 28 and 29 June and will offer four streams of clinically led CPD, with an exhibition of around 25 companies and a social calendar that includes a traditional Welsh Twmpath, a dance night on the seafront. The programme for VetsSouth (6 to 7 March 2019, Sandy Park, Exeter ) and VetsNorth 2019 (12 to 13 June 2019, AJ Bell Stadium, Manchester) – the same for both events – have been announced and are available to view at www.vetssouth.com and www.vetsnorth.com where early bird offers and registration are available. Medicine and surgery of the endocrine system and emergency medicine will be the focus this year. The programme also introduces an extended nursing stream on surgery and emergency and critical care nursing. Speakers include Ed Hall, professor of small animal internal medicine at the University of Bristol who will discuss pancreatitis in the dog; Georgie Hollis, founder of Intelligent Wound Care, a company that aims to bring the best of modern wound care to veterinary practice, and veterinary welfare campaigner and vet Emma Milne who will discuss welfare issues relating to brachycephalic animals. An exhibition showcasing the latest veterinary products and services, demonstrations and workshops will run alongside the conferences. The British Equine Veterinary Association (BEVA) one-day course ‘Remind, Refresh, Revitalise – getting back into equine practice’ takes place at the Liphook Equine Hospital, Hampshire, on Wednesday, 13 March 2019. It is an entirely practical day of CPD that is dedicated to improving the confidence of established equine vets and vets returning to work following a career break. It focuses on practical procedures that an established equine ambulatory vet might be expected to perform on a regular basis. In a new approach to CPD, BEVA is trialling a system where delegates can shape part of this CPD day for themselves by selecting from a choice of practicals through a pre-course online poll.